U.S. Secretary of State John Kerry sits with Saudi Arabia Foreign Minister Adel al-Jubeir (right) and Syrian Opposition Leader Dr. Riyad Nijab on Feb. 11, 2016, before a three-way meeting focused on Syria preceding the Munich Security Conference. Russia is proposing talks about a cease-fire in Syria, but European diplomats are skeptical about the offer, which they see as a delaying tactic that would allow intense Russian airstrikes in Aleppo to continue. Russian Foreign Minister Sergei Lavrov said Moscow had submitted a “quite specific” proposal. “We will wait for the American response before we take it to the ISSG [International Syria Support Group], Lavrov said in Munich Thursday as he sat down for talks with Secretary of State John Kerry. Western media reports say Russia is proposing a cease-fire to begin March 1 - too late to avert a worsening humanitarian crisis in and around Aleppo, Syria's second-largest city, near the border with Turkey. A U.S. spokesman said Washington wants an immediate truce. FILE - In this Dec. 9, 2015 file photo made from video footage provided by the Russian Defense Ministry, a Russian Su-34 bomber drops bombs on a target. A senior member of the Syrian opposition said any cease-fire would be welcome if it ends "the current Russian campaign of slaughter," but there must be guarantees that all of the Damascus regime's backers - including Iran-funded militias and fighters from Lebanon's Hezbollah movement - observe a truce. The head of another rebel coalition, however, said Russia's proposal was simply "a trick which the [Assad] regime will use to prepare for other military operations." 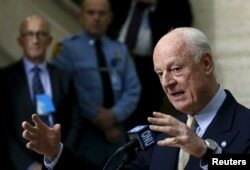 The top U.S. diplomat said he hopes for progress on humanitarian access to civilians in Syria as well as a cease-fire. European diplomats told VOA they feel delaying a cease-fire for several weeks would allow Russian and Syrian government troops to complete their operation to retake Aleppo and send even more refugees fleeing toward Turkey. Regaining control of Aleppo, which has largely been under rebel control since mid-2012, would mark a possible turning point in Syrian President Bashar al-Assad's drive to crush his opponents. “This is straight out of the Kremlin’s playbook,” said a senior European Union diplomat. He compared the Russian negotiating stance on Syria to Moscow's handling of the fighting between government forces and separatist, pro-Russian militias in Ukraine. Kerry and Lavrov were to join other members of the 17-nation International Syria Support Group later Thursday - the first full ISSG meeting since talks about a possible political solution to the Syrian crisis bogged down earlier this month. Opposition protests against the intense aerial bombing campaign by Russian and Syrian government forces have delayed efforts to resume the U.N.-sponsored talks, along with diplomats' inability to agree on which rebel factions would be included. FILE - U.N. mediator for Syria Staffan de Mistura gestures during a news conference after a meeting with the Syrian High Negotiations Committee (HNC) during the peace talks at the United Nations in Geneva, Switzerland, Feb. 1, 2016. U.N. Syria envoy Staffan de Mistura has delayed until February 25 the next effort to get "proximity talks" underway. These would include members of the Damascus government and the main opposition groups in the civil war, but not meeting directly with each other. A Turkish official told VOA Russia might be talking about a truce now because its military assault on Aleppo is now complete. “Now they can focus on ... preparing for the next stage – Idlib,” the Turkish official said. Relief organizations have denounced the world powers for discussing a political solution to the five-year-long civil war while not doing enough to save the lives of endangered civilians. Syrians gather at the Bab al-Salam border gate with Turkey, in Syria, Feb. 6, 2016. In the past week, since a donor's conference about Syria in London, nearly 100,000 Syrians have fled from their homes, International Rescue Committee President David Miliband said. The ongoing humanitarian crisis is “making a mockery of the international community’s commitment to help Syrians,” the former British Cabinet member said. Plans to resume proximity talks between the government and opposition hinge on whether world powers can make sufficient progress in efforts to secure a cease-fire and provide humanitarian access to affected civilians.